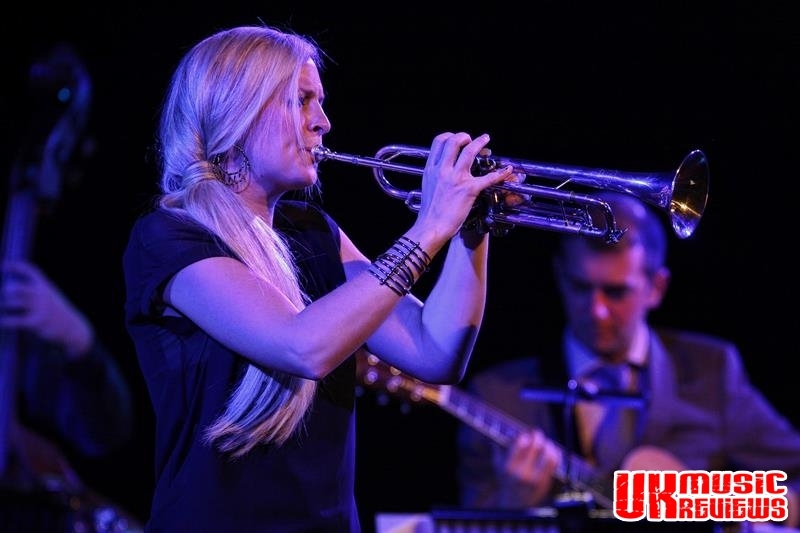 Alison Balsom performing her ‘The Trumpet Sings’ Tour at The Royal Concert Hall Nottingham on Friday 3rd October 2014. 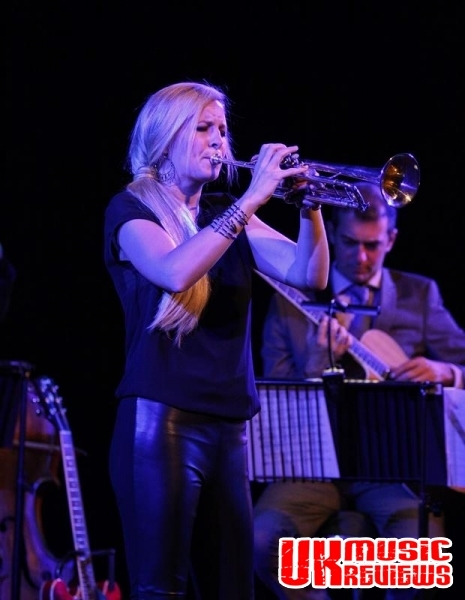 British Trumpet player, Alison Balsom has established herself as one of the leading performers on her instrument, and tonight she presented a truly eclectic evening at The Royal Concert Hall with her own musicians. During her 90 minute set she showed us exactly why she is now one of the most highly regarded trumpeters and exciting classical musicians of her generation, as her infectious performance and signature tone quickly became a firm favourite with the music connoisseurs amongst this audience. On her first solo tour, she delivered a spectacular and colourful musical journey by playing pure classical music and by using enhanced lighting and sound to present her more contemporary music. Starting with Bach on the piccolo trumpet, the journey continued with an expressive and melancholy Syrinx by Debussy, Erik Satie’s Gymnopedie 3, with pit stops for the more up tempo and swinging Gershwin’s Someone To Watch Over Me, Reinhardt’s Nuages and Clifford Brown’s Joy Spring. Balsom sounded sublime and really came into her own with an exquisite range of subtle phrasing and dynamics as she lulled us into Piazzolla’s Oblivion and Libertango. She made sure that there was something for everyone to enjoy as she used the stage lighting to its greatest effect. We found ourselves in the greens and blues of a rainy moody Paris in springtime as she perfectly delivered Vernon Duke’s April In Paris, to the arrival of autumn with its warm golden glow as we listened to Kosma’s Autumn Leaves. Even Kern was given the star treatment with a really moving rendition of The Way You Look Tonight. 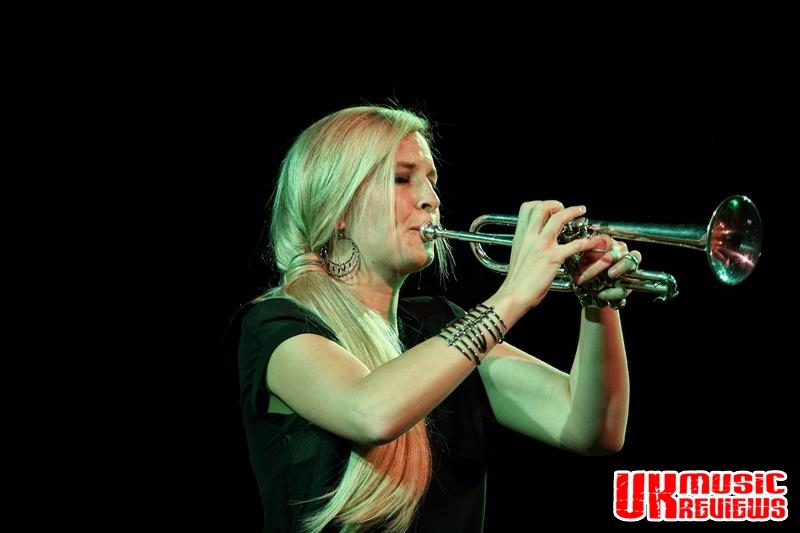 Alison Balsom truly is a special player, but I would go further than that; she is a sensational player. With her talent and versatility, she is simply awesome.